Check out our fun carrot facts for kids. Learn interesting information about the carrot, its use throughout history and different ways carrots are prepared for eating. Were carrots always orange? What country produces the most carrots? Find out the answers to these questions and much more with our fun carrot facts for kids! The carrot is a root vegetable with the most commonly eaten part being the taproot. The domesticated carrot that we know today originated from the wild carrot called Daucus carota which was native to Europe and south western Asia. The actual plant of a carrot (greens above ground) can grow up to 1 m (3.2 ft) tall and flowers around June to August (northern hemisphere summer) with a bright white flower. Cultivated carrots are usually made up of about 88% water, 7% sugar, 1% protein, 1% fibre, 1% ash, and 0.2% fat. Carrots are cooked and eaten in various different ways. The vegetable is often pulped, mashed, boiled, puréed, grated, fried, steamed, stewed, baked, juiced or eaten raw. Carrots are typically used in stir-fries and salads but also in soups and added to baby foods or pet foods. They can be dehydrated or deep-fried to make chips, flakes, and powder. The natural sugars and sweetness of carrots allow them to be used in carrot cakes of western countries, in India they are used as desserts, while countries such as Portugal use carrots in jam. Carrot juice is widely consumed, especially as a health drink, with or without other fruits and vegetables. In fact even the greens are edible as a leaf vegetable although this is rare. Ancient Greeks and Romans ate carrots but not the orange varieties we know today, they ate the less cultivated wild varieties of various other colors. In the 17th century western carrots first appeared in the Netherlands. Dutch carrot growers invented the orange carrot in honor of the House of Orange, the Dutch Royal Family. The orange colour results from abundant carotenes in these cultivars, mainly the beta-carotene which is a strongly colored red-orange pigment found in some plants and fruits. 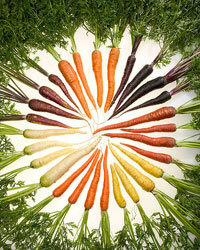 The human body turns beta-carotene into vitamin A and carrots are one of the best sources for beta-carotene. Vitamin A is important for the health of our vision (including our night vision) as well as our bones, teeth and skin. The urban legend that 'eating large quantities of carrots helps us to see in the dark' was developed from stories started in World War II. British gunners were shooting down German planes at night and to cover up the fact that it was the effective use of radar technologies that was achieving this, the RAF circulated a story about their pilots' high level of carrot consumption. The world's largest carrot producer is China, which in 2011, accounted for over 45% of the global output. China was a long way ahead of Russia and the United States who are the second and third highest producers respectively. The carrot is in the top 10 of most economically important global vegetable crops. It is true that eating massive amounts of carrots can sometimes cause a person's skin to turn yellowish orange. This is most noticeable on the palms or soles of feet and is called carotenemia. But don't worry it requires a high amount of carrot consumption and is completely fixable just by reducing carrot intake.